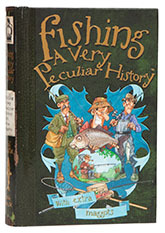 I wish there were more books about fishing like this one – by turns witty, anarchic, informative and fun, but mostly completely barking. A Very Peculiar History is probably aimed at complete beginners looking to find out about the sport, but given that Rob concludes his historical section on page 26 with the death of Benson, I’m not so sure. I read the book through several times and it makes just as much sense if you start at the back as the front, but although I still haven’t the faintest clue what Rob was on when he wrote it (clearly good stuff, though), I would definitely buy a copy and save it up for Christmas if I had someone in mind who wanted to get an idea of what angling was like - or what a Waterlog editorial meeting was like, for that matter, or just about anything involving fish, fantasy and baits and boilies. There's some fly fishing in there as well, not to mention confirmation that gwyniad really do nick people’s cars. Great design, far off the wall, as funny as all got out and worth buying as a bog book, even if you have fished for forty years. One thing I can guarantee is that by the time you get to the last page, you still won’t have the slightest clue why you started reading it, but your life will definitely have changed for the better. As good inside as it looks from the outside.